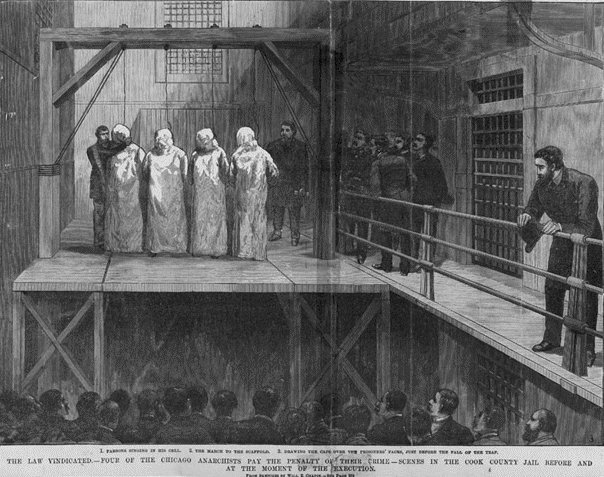 On this date in 1887, the Chicago political machine hanged four at Cook County Jail to defend civilization from the eight-hour day. 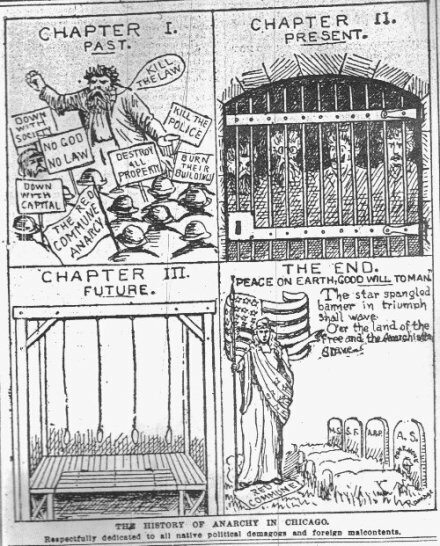 The Haymarket martyrs, as they would be remembered ere the hysterical atmosphere of their sentencing had passed, were four from a group of eight anarchist agitators rounded up when a never-identified person threw a bomb at Chicago police breaking up a peaceful rally. The bomb killed one cop; the indiscriminate police shooting that followed killed several more in friendly fire, plus an uncertain number of civilians. Mark them for today. Hold them responsible for any trouble that occurs. Make an example of them if trouble does occur. Law is upon trial. Anarchy is on trial. These men have been selected, picked out by the grand jury and indicted because they were leaders. They are no more guilty than the thousand who follow them. Gentlemen of the jury; convict these men, make examples of them, hang them and save our institutions, our society. That was the argument for hanging them. And right-thinking burghers applauded it. Then begins a scene of horror that freezes the blood. The loosely-adjusted nooses remain behind the left ear and do not slip to the back of the neck. Not a single neck is broken, and the horrors of a death by strangulation begin. Six years later, Illinois Gov. 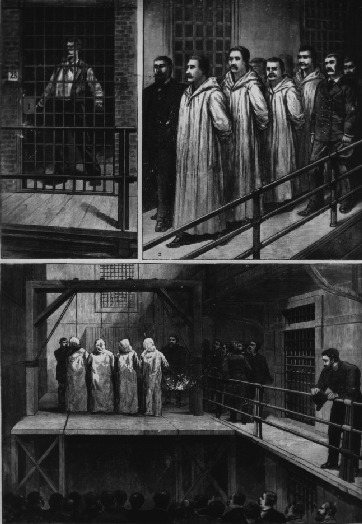 John Altgeld granted the free pardon the hanged men had demanded to the three surviving Haymarket anarchists. There is no institutional mechanism to determine erroneous executions in American jurisprudence — a fact that occasionally leads to smugly circular avowals that nobody recently executed has ever been “proven” innocent — and death penalty researchers Michael Radelet and Hugo Bedau believed as of this 1998 paper (pdf) that Altgeld’s executive statement flatly asserting the injustice of the Haymarket convictions was the most recent official acknowledgment of a wrongful execution in U.S. history. If true, its uniqueness would be understandable: the gesture cost Altgeld his political career. Long gone as all these principals are, the legacy of Haymarket remains very much with us, and not just as a magnet for digital archives like this, this and this (don’t miss the brass gallows pin). May 1, now rich with the symbolism of the Haymarket Passion, was soon selected by the international labor movement as the date to resume the eight-hour-day push — thus becoming the global workers’ holiday it remains to this day. * Opposing interpretations of the Haymarket affair — which can be the “Haymarket riot” or the “Haymarket massacre,” depending on where you line up — were marked by opposing memorials. The police memorial was itself eventually bombed by the Weather Underground, and subsequently squirreled away from easy public view. Paradoxically, the Haymarket Martyrs Monument has been federally dignified as a National Historic Landmark.